The USD to cad pair has reached an interesting point in the recent rally from the lows of 1.08, as we now approach the first level of serious resistance since the upwards move began. Following the strong move higher on Monday the price action of the remaining days has simply consolidated sideways in a relatively narrow range and yesterday’s candle was no exception ending the day with a narrow body and deep upper wick. 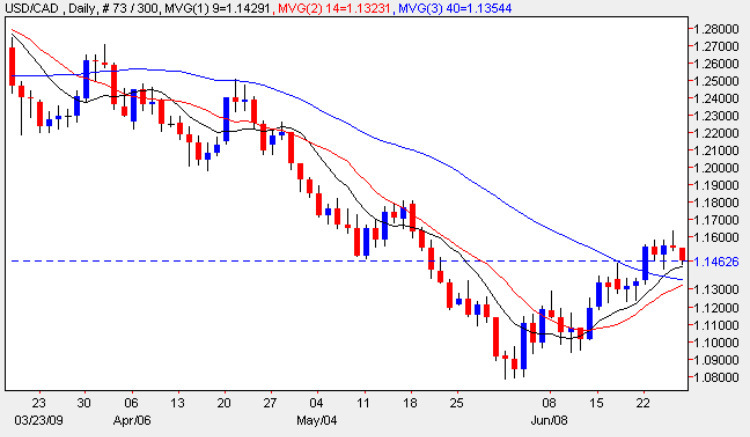 In itself this may suggest a bearish tone in the short term indicating both that the bears overcome the bulls in yesterday’s trading but also that the resistance level at 1.17 provided a barrier to any move higher. Counterbalancing this argument the 9 day moving average has now firmly crossed the 40 providing a bullish signal with Wednesday’s low of the day finding good support from the 9 day moving average and indeed so far today, the low has once again bounced off this technical indicator suggesting a move higher rather than a reversal lower. On balance it would seem that this may simply be the market is taking a breather in this pair before continuing higher but this would require US Dollar strength to return which is sadly lacking at present and particularly when viewed on the Dollar Index Chart which has a decidedly bearish feel at present. My trading suggestion for this pair is to stand aside given the somewhat contradictory picture on the daily chart.